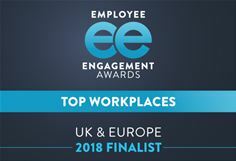 London – November 08, 2018 – The 2018 UK & Europe Employee Engagement Awards, today announces its shortlist of finalists. These are the companies that the judges believe put the employee experience at the heart of their business. The winners will be announced at the awards ceremony at Twickenham Stadium on January 24, 2019. The Employee Engagement Awards (EE Awards) is the first and only global, dedicated Employee Engagement Awards & conference business. We believe in inspiring and educating people to remake the way organisations think about, and engage, people to achieve their purpose. That’s why we created, and continue to improve, the Employee Engagement Awards; to provide a platform to recognise excellence in engagement that inspires action and drives the industry and the employee experience forward. Entering and hopefully winning, The EE Awards will provide you with industry acknowledgement and an important competitive advantage to attract the best talent.